Frustrated by video storage limits? Credit card fraud, alcohol and tobacco sales, injury claims, workers compensation, charge-backs, shrink, and ID verification compliance all pose significant risk to retailers. The civil and criminal liability risk associated with these events may exist for years, well beyond the life of the standard video archive. Access to high risk transactions, events and exceptions with traditional video solutions is easy for the first 30-90 days, then the store video archive is overwritten and gone, forever. Even with advances in hard drive technology rarely do conventional video systems provide an archive longer than 6 months. New high resolution optics, 360 degree cameras, enhanced frame rates, and high definition and mega-pixel camera options quickly offset gains in storage. Cloud solutions and high capacity NVR video archives are an option but high bandwidth requirements, database administration expenses and storage fees effectively negate any return on investment. So how do you protect your business from fraud and liability after your video archive expires? With our Enterprise Exception Archiving™ tools. 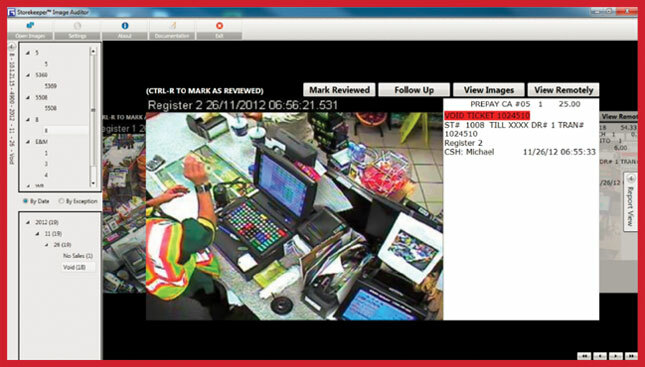 The Storekeeper™ Event and Image Archiver™ identifies high risk transactions, events and exceptions, then extracts and refines the video and stores the digital record locally or globally for years. The stored data and image record is generally 1-2% of the size of the original video record, requiring minimal bandwidth to migrate and little or no database or storage expense. Whether stored at the store, in the cloud, or on your corporate server, the event and image archive may be recalled and distributed on demand, dramatically reducing your long-term exposure to liability and loss.